Now you can easily and securely attach your iPad tablet to any VESA compatible arm, stand or wall bracket and use as a PC monitor with the CUZZI D-IP1 holder VESA bracket. 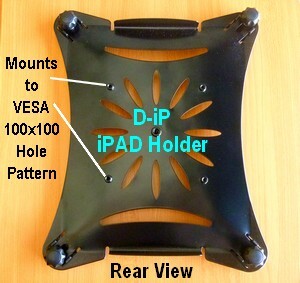 This iPad VESA adapter mount will hold you iPad tight on any LCD monitor arm, mount or bracket. 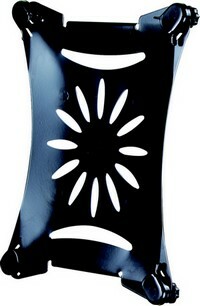 You can attach it to any of the LCD mounts or arms shown on our website. 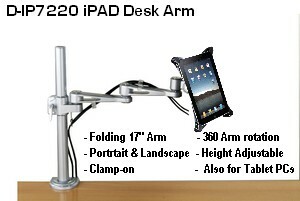 Simply choose if you need to attach the iPad on a wall, desk or counter, table, pole, dental chair, industrial machine, ceiling or even the floor or on a mobile computer cart. 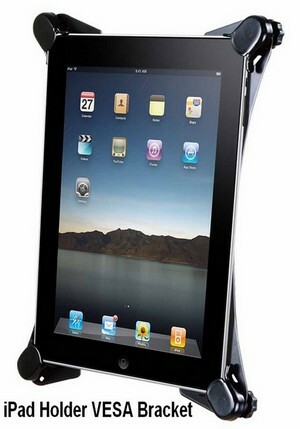 This is a safe way to attach your iPAD, instead of using the low quality plastic holders available online. * Dimensions: will hold an iPAD or any tablet PC from 7" W x 9.25" H to 8.25 W" x 10.25" H.
The CUZZI iPAD holder plate attaches to VESA hole patters 100 x 100 mm. 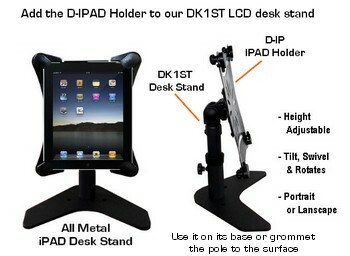 Install your iPAD it to any LCD mount on our website .